The four vestments belonging to St. Bonifacio (San Bonifacio), Bishop of Ferento came from Ferento which was destroyed by the people of Viterbo in 1172. The alb, a white liturgical robe in linen that is commonly called shirt. 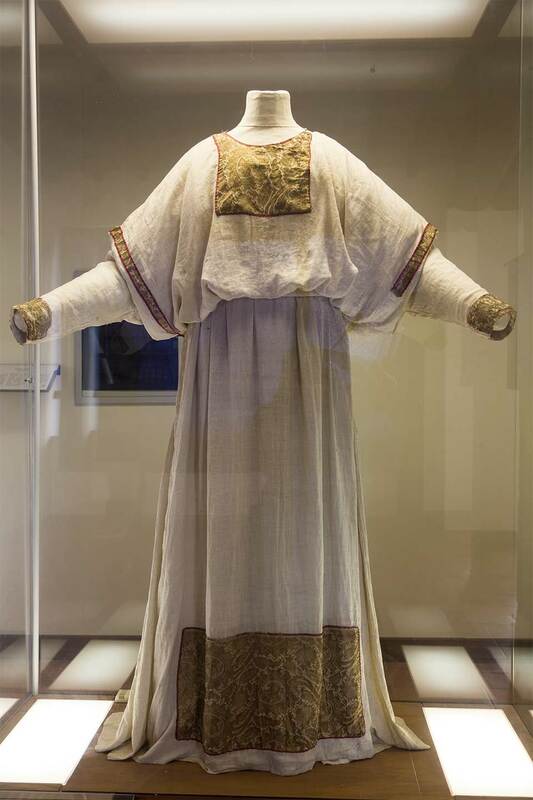 The amito a rectangle of linen that covers the priest’s shoulders under the shirt (as used by Roman priests), or above (as the Ambrosian and Maronite priests). The stole is made of a silver woven textile and decorated with Byzantine style geometric designs embroidered with red silk threads. The cingolo girdle or belt in silver brass with iron ties is kept in the display case along with the silk and gold pallium of Giovanni XXI to protect the other vestments. Tradition says that most of these vestments are from the 12th century keeping the style of the 6th century. Recently a later datation – the 14th century- has been proposed with an attribution to Italian masters active in Lucca or Venice. These pieces were restored along with all the Museum’s textiles in 2011. Overview of vestments of St. Bonifacio.